There’s a common trope among conservatives that we’re living in an era of moral and cultural decay. With a nervous sweat on their brow, they cite Elvis Presley! Marilyn Manson! Miley Cyrus! and call for censorship, suggesting it’s the American thing to do. (And, I suppose in some ways it is). 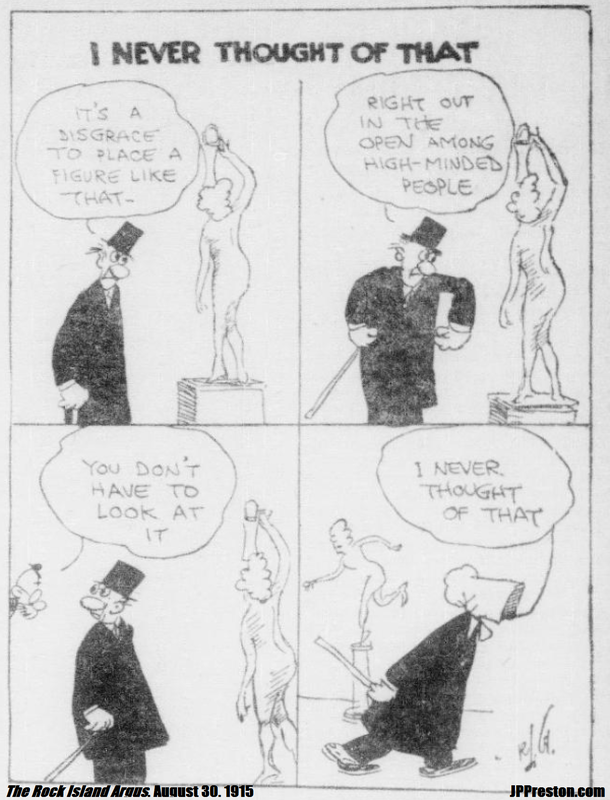 But, alas, this kind of outrage is nothing new — the following comic was printed in Illinois’ Rock Island Argus in 1915. Replace the statue with Beyonce and the old, white aristocrat with … the old, white, aristocratic Gov. Mike Huckabee and it’s just as relevant a century later. “I Never Thought of That,” The Rock Island Argus. August 30, 1915.